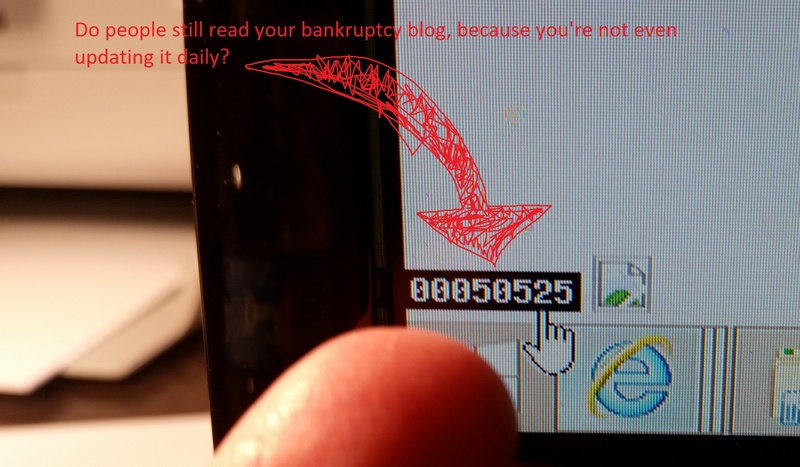 Do people still read your bankruptcy blog (because you’re not even updating it daily)? The blog just hit 50,000 views according to one stat counter (some others give wildly higher numbers, but this is the only widget that I could figure out how to install). This bankruptcy blog has 488 separate blog posts on various bankruptcy topics, and although I haven’t covered them all, I hope that I’ve at least hit the basics. I have a friend who is a good bankruptcy attorney and a world-class cake decorator. Two years ago she showed me how her cake blog had over 20,000 views, and I became a little envious, even jealous. The day after she showed me, I installed my little stat counter and checked it feverishly. Now that it has hit over 50k, I feel that I can brag a little. Another friend (also a bankruptcy attorney), pointed out that I am lying on my blog: it is no longer updated daily. He’s right, and I’ve had to change the language at the top to reflect that. I do still post updates, and if you have a bankruptcy question, please send it to me so that i can answer it and have some more entries. This entry was posted in Utah Bankruptcy on November 29, 2016 by robertspaynelaw.